#1.2 12 Best Fireproof Home Safe & Cabinets on the Market! Protecting your valuables, including media files, firearms, and jewelry, are incredibly important to you. They may not only have great monetary value to you, but may be keepsakes you simply can’t afford to depart with. This is why you want the very best safe. A major issue that you may have with your safe is that fire can still damage your valuables, so you want a safe that is going to be able to withstand the intense heat for a long enough period of time to enable the fire department to be able to respond and put out the fire. This is why you need to find one of the best fireproof safes on the market today. Of course, protecting your valuables from burglars and thieves is not the only concern that you may have. It is true that you want something that will protect your property from thieves, but you are also likely looking for something that can withstand a great deal of heat. What Constitutes a Gun Safe “Fireproof”? Do Fireproof Safes Really Work? Why Choose a Safe with Fire Resistant Properties? What Fireproof Safes are Made of? Where to buy a fireproof safe? What is a good fire rating for a safe? Is keeping cash at home safe illegal? What is The Best Fire-safe? Top Fireproof Safe & Cabinets on the Market Right Now! While there are safes made with the same level of quality and performance, it is important to understand that there are certain units that are made for specific purposes. This means you want to have a safe that is going to fit the needs you have while also providing you with the protection you are looking for. 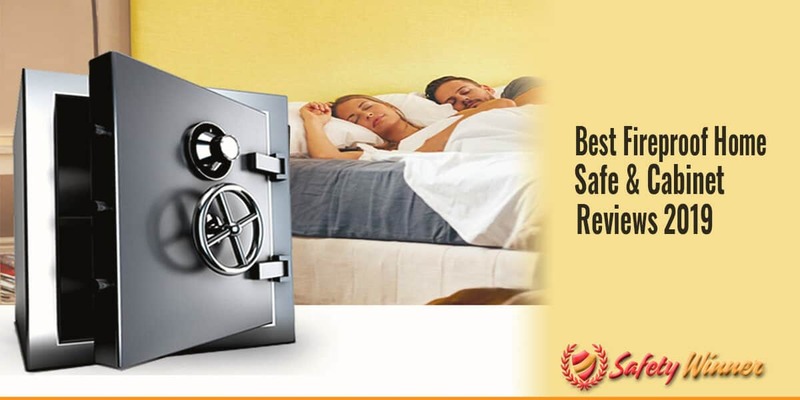 Here are 12 safes categorized by specific needs to help you to find the ideal choice for yourself. 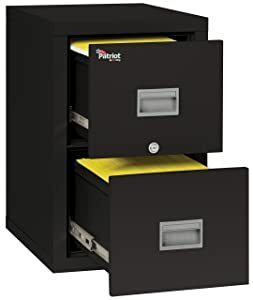 Maybe you are looking for a safe that not only provides you with fire and theft proof protection, but also gives you the perfect organizational system, very much like a file cabinet. If that’s the case, then a file cabinet safe is exactly what you are looking for. This Patriot option gives you deep, wide drawers that can handle both letter and legal sized paper. There are two drawers, each can be adjusted to fit the size of paper you desire, allowing you to choose how the safe can best fit your needs. While this is a great design for any organization or individual who needs to protect their files while also allowing them to have easy access into the cabinet, you will also love the fact that it gives you a great deal of protection. Each drawer in this file cabinet is protected by oven dried gypsum insulation which resist the heat of a fire for up to one hour. This ensures that you have plenty of time to notify the fire department and have them respond to your home or office to put out the fire before any damage can occur. The file cabinet is secured with a single lock mechanism that secures both drawers at the same time. Two keys are provided, allowing you to carry one with you while having another one available to store in another location in case an emergency arises. The one thing you will really like about this file cabinet is that it looks like any other. Despite the additional features and protection that it offers, it doesn’t take up any additional space and no one would think that this is a file cabinet any different than any other option you may have in your home or office. It truly is a great option that you will be happy you made if there are a number of files you need to keep protected. As a home safe, there may be no better option than this one. Not only does it get one of the highest ratings in terms of being fire resistant, but it is also one of the highest rated in terms of being burglary proof. The safe is made with a solid steel construction, and has four predrilled anchor holes, including all of the hardware necessary for you to be able to quickly and easily install this into a wall, floor, or other area of your home where you intend to anchor it. The heavy duty steel not only makes this safe fire resistant, as it can handle up to two hours of heat up to 350°F and one hour up to 1830°F, but this unit is also made to be a burglar’s worst nightmare. The door is 4 ½ inches thick, making it impact resistant. The hinges are made with heavy duty solid steel and the body is one and three-quarter inches thick all the way around. The thickness of the steel also makes it drill resistant, as a hard plate is inserted in each side of the safe. The locking mechanism employs a standard combination lock that enables you to be able to set your own combination easily. The tumbler uses a smooth gliding process that makes it difficult to determine when a specific number has been reached to begin the unlocking process. This makes it even more difficult to try to access this safe if you do not know the combination. If you are concerned about your valuables, not only wanting to keep them secure, but safe from fire, this is truly the option for you. It can survive a two-story fall without breaking open, and is easy for you to install. 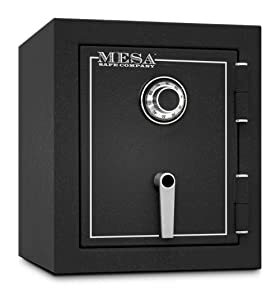 Mesa Safe MBF1512C is truly the perfect option for you. While protecting your valuables is important no matter what you may have, there are those who have specific needs, and this is why those who are looking for a safe that is fire resistant to protect their long rifles should take a closer look at this option. It is truly what you may be looking for. This long gun fire protection safe provides you with up to 60 minutes of resistant from fire up to 1700°. That should be plenty of time to get the fire out before your weapons are damaged in any way. A digital keypad is used to unlock the safe, which can be programmed by you. In fact, you can choose any combination from 5 to 9 digits, making it even more challenging to try to figure out how to get into your safe. Plus, five 20 mm bars secure the door in place once the locking mechanism is activated. This makes it one of the highest grades in terms of pry resistance, and it comes with a great deal of impact resistance as well. It is able to handle a two floor drop while still maintaining the integrity. You also find that the safe is eight times stronger than most other forms of safes, making it drill resistant is well. Steelwater AMSW592818-blk fire-safe is truly a fantastic option in terms of providing you with the greatest amount of security. Inside the safe, there is an incredible amount of storage space available to you, not only allowing you to organize but also secure up to 30 firearms. The door has six pouches that allow you to slide handguns into the pouch to secured in place while also making it easy to grab in an emergency. Six additional pouches are included to store magazines, ammunition, and other accessories. Inside the safe are five adjustable shelves that allow you to use the entire safe for the security of long rifles, or to add specific shelves to organize ammunition, magazines, kits, and other accessories you may have. There is a great deal of room inside the safe, making it a fantastic option for any person looking to secure their firearms. 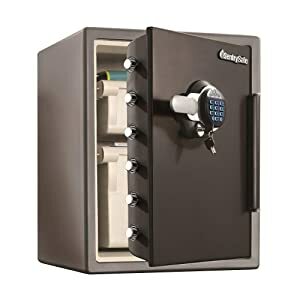 If you are looking for a safe that provides you with additional storage options, then this may be the perfect choice for you. The largest size is the 2.05 ft.³, but there is a 1.23 ft.³ and a 0.8 to cubic foot as well. Each, with either a dial combination or a digital keypad, which allows you to choose the option that best fits your needs in terms of protection and size. We will mainly address the larger sized option, the 2.05 ft.³. While all three are fire resistant for up to one hour at 1700°, the larger sized safe gives you much more storage capacity. This includes two slide out drawers, that allow you to be able to easily organize files and other media that you may have. Think of it as akin to the little file cabinet that often comes with a desk, providing you with a drawer to put in pens and other small items, as well as giving you a large storage door to hold files. This is very much how this safe looks on the inside. The top storage drawer gives you space for DVDs, CDs, flash drives, external hard drives, and other media files, as well as handguns, and jewelry. Sentrysafes are so much popular for their excellent features. The door is held in place with six 20 mm bars that make it both pry resistant and impact resistant. An internal light is included when the safe is open and the top drawer can be locked using a separate key. You are able to set the lock combination, regardless of whether you are choosing the combination or digital option. They are both easy to set, and an emergency key is included as well should you have forgotten the code or combination. Besides being fire resistant, the safe is waterproof as well. It can withstand a minimum of 24 hours submerged 8 inches above the top of the safe. This should give you plenty of time to remove the safe and its contents before any damage occurs. Steelwater has really outdone themselves with this fireproof option. You can be sure that you were going to get the very best in terms of a fire retardant unit as it is able to resist in the heat of the fire for up to two hours at temperatures reaching 1850°F. This safe gives you that kind of protection because of its incredible design. Every part of the frame and interior of this safe is made of layers of steel, meaning there is no plastic in the door, hinges, interior, or frame of the safe. That ensures that it is able to withstand higher temperatures and prolonged heat without damaging your items inside. When the locking mechanism is activated, two bolts hold the door in place by attaching the locking mechanism to the frame of the safe, making it both pry resistant and impact resistant. While the hinges are on the exterior of the safe, don’t let this lead you into thinking that there will be an issue of someone pulling out the door. It is incredibly difficult to do so, and would require a large amount of force to have success. The safe uses a electronic keypad lock with 4-16 digit comobinations. The wheel cannot be removed, and you are able to program your own code. Included are two emergency keys should you have an issue with losing or forgetting your combination. The interior is .99 ft.³, and comes with one adjustable, removable shelf. This allows you to store things in a more organized manner if you need, or to store larger sized items by simply removing the shelf. Predrilled anchor holes are included with your purchase. This allows you to lock the safe in place, and all hardware needed is included as well. To make the safe a little easier to install, the door can be removed, reducing the amount of weight so that it is easier for you to move around the safe to get locked in place. 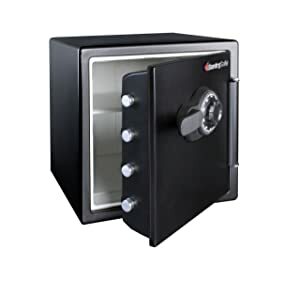 If you are looking for the kind of fire resistant safe helps you to better organize a large number of documents, then this Honeywell option may be exactly what you are looking for. 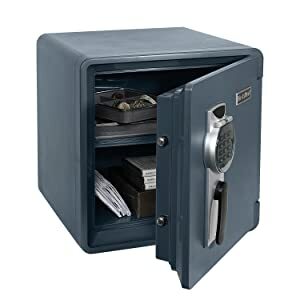 This is the perfect protective safe for a person or business that needs to store documents in a secure location, while also being able to give you quick access and great organization. It starts with a great design that is perfect in terms of how it allows you to store legal documents, letters, CDs, and other forms of media. 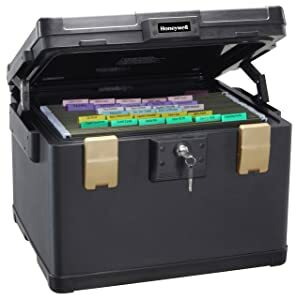 This file safe chest, opens as you would think, as you use a key to unlock the safe, and to flip action latches are released to open the lid. From there, you can easily thumb through documents to find whatever file you were looking for. It’s very much like having a small file cabinet. Of course, you are looking for a box that is able to resist heat and fire, and this safe can do both. It will give you up to one hour of protection for up to 1700°F in temperature. This is one of the highest ratings you will find of any safe box, and is why this is such an exceptional choice for you. The benefits go beyond this, however. In addition to being fire resistant, the safe is also waterproof. You can be sure that the items stored inside will be safe and protected for at least 24 hours if the safe is submerged in up to 39 inches of water. This should be plenty of time for you to be able to retrieve the safe before any item and it was damaged. Honeywell has long established themselves as a trusted company, and you can be sure that this product is one that you can count on. It gives you the flexibility to take your safe with you should you need to move it to another location, but weighs enough to make it difficult for someone to try to take. Truly a fantastic option that should handle all of your media security needs. First Alert is a company that provides quality products, and you can be sure that this is a sensational option. Not only will it keep your guns and other valuables safe from such things as thieves, fires, and floods, but the impressive construction and design will make you feel that you have made the very best possible choice. It starts with the fact that this safe is able to withstand up to 1700°F of heat for up to one hour while still being able to protect your valuables. They should be plenty of time for first responders to be able to put out the fire, ensuring that your safe and its contents are well protected. Besides being resistant to fire, this safe is also perfect for those that may have issues with water damage. If you live in an area where floods are known to occur, or you are planning on putting your safe and a basement area, this would likely be the perfect option for you. You will feel very confident to know that this safe is built to be fully submerged while still being able to keep your contents protected and undamaged. Because of the design and its ability to withstand both heat and water, you can be sure that any type of media, whether it is digital or not, will be well protected within the safe. This will assure that your records, pictures, and other storage devices remain unsafe during the most hazardous of conditions. To secure the safe, a digital lock and key pad is the mechanism used to secure the door. You are able to generate your own code to access the safe, and an override key is provided should you forget what that code is or the mechanism becomes damaged in some way. This ensures that you are never locked out of your safe. The keypad is protected by a plastic flip up cap. The safe is both pry resistant and can handle heavy impact. Inside the door are five hooks to hold keys in place, plus a small pouch to hold important documents like your passport. There is also a shelf to help you organize your items. The safe is 93 pounds and the exterior is 18″ x 17.5″ x 19.6″. The hardware to lock the safe in place is also included. If cost is a bigger concern for you, you should know that there are some great options for you, and it starts with this fantastic SentrySafe unit. This is a 1.23 ft.³ safe with an adjustable shelf that can be removed altogether or installed in nine different slots within the safe, ensuring you are able to get the space you need. This safe is a fantastic fire resistant option, which can endure up to one hour of heat at 1700°F, making it perfect to be able to store your digital media and files without concern of them getting damaged. Plus, it can handle at least 24 hours of being submerged in water before you have any concern about this safe at all. Clearly, the fire resistance and waterproof features give you plenty of time to retrieve your safe or its contents before any damage can occur. The locking mechanism uses for live bolts, each made of heavy duty steel construction. This securely locks the door in place and with the hinge inside, you get optimal pry resistant protection as well. This will help you to have great peace of mind to know that your safe is not easily going to be broken into. If a safe that looks more like a chest is what you are looking for, then here is a perfect option for you. 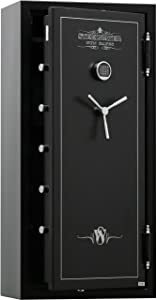 This 56.0 pound unit is 19.9 inches long, 14.8 inches wide, and 3.8 inches deep, giving you plenty of storage space to be able to keep important documents, including easily sliding legal sized folders and papers into this safe, while also being able to store other important and valuable items you may have, including firearms. This is the perfect safe for those who are looking for a place to store there important documentation in jewelry. 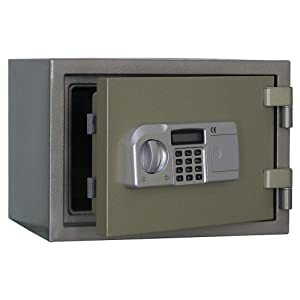 You are not only able to secure CDs, DVDs, and other media files, including portable hard drives, as there is plenty of space inside, but this safe is built to ensure that they are safe and secure. The safe is able to handle up to 350°F of heat for one hour without any damage to your items. It is also waterproof submerged for up to 2 hours period of time. This gives you the right kind of protection that you need for your items, as even at 56 pounds you should be able to remove it and take it with you should some emergency occur. The external body of the safe is built with a heavy duty metal that includes plastic latches to hold the safe closed. The keylock is included, that is durable and easily open stir use of the key. However, one should not consider this lock to be burglar proof. 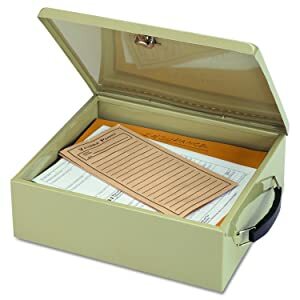 This is the perfect kind of safe for someone who has documents that they need to store and to keep well organized. The depth is such that you are able to put file folders and other documents so that they are easily accessible through the organization system you employ. Plus, you can choose to store other kinds of items in here that you feel need to be protected. This is truly a fantastic option for those who just want to safe to protect the things that are most important to them. Maybe what you are looking for is a secure product that enables you to be able to carry documents while also protecting those documents from fires or water. This is where this Avlone document bag is ideal, especially for those who will be carrying money on a consistent basis. This bag begins with a document holder that is both fire and water resistant. The double closure seals the bag perfectly, ensuring that water and fire are not able to seep into the bag. Plus, the external covering of the bag is specifically designed to reduce heat and resist water from seeping in. There is plenty of size inside this bag. It is 15” x 11” x 2.5”, making it perfect for you to fit an electronic device like a laptop or tablet, or carry legal documents, large amounts of cash, or any other item that you need to safely protect. For those who travel a lot and need to ensure that their equipment, like their laptop, is well protected this is the ideal choice for you. 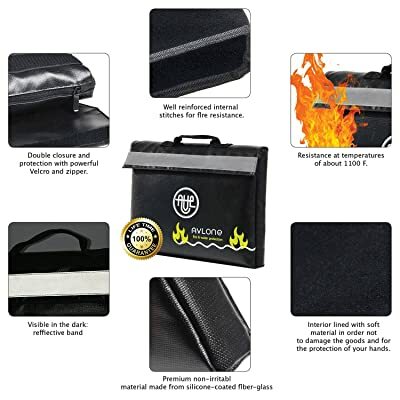 What separates this bag for many other options available out there is that it gives you a fireproof option. This ensures that if you or the person who is delivering money to your store or home is in a serious accident or if the car is damaged in some way, you can be sure that your money and other important documents are protected. Plus, a reflective tape on the outside ensures that it is visible simply by shining a flashlight on it. Included with the bag is a durable quick grab handle that is not only easy for you to grab but difficult to pull it away from the bag itself. This ensures that some would-be thief is not going to rip the baguette of your hands. Plus, it comes with a foldable design to reduce size if you so desire, and all stitching is done to ensure that fire and water cannot get inside the bag. The soft coated interior protects your items inside the bag. For any person who is running a business where money needs to be transferred to the bank, this is the perfect option for you. If you are personally carrying documents for yourself that need to be protected, you’re not can find a better bag than this. Maybe you are in need of a lockbox for your business, then this is a great option for you. This is a fire resistant box that not only gives you great security protection from thieves, but also gives you a great place that you can store items while not having to concern yourself with damage due to a fire. The boxes made with a reinforced solid steel wall, that is impact resistant. Not only is the door and frame corrosion resistant, but bolts are so as well. This will help to ensure that you don’t have to worry about a lockbox weakening over time, as corrosion will not be an issue. An easy to program digital code is used to gain access into the box. In addition to placing the digital code, users must place their thumbprint over the sensor to gain access into the box. This adds an additional layer of security. The unit is able to store up to 20 different imprints, ensuring that only those you wish to access the safe are going to have access while still giving multiple people the ability to get into the lockbox. Two emergency keys are included. This box is ideal for storing a wide array of items. 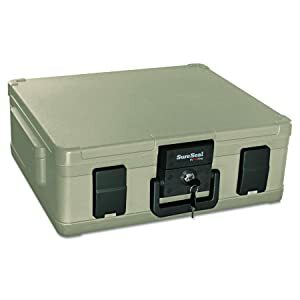 The lockbox is 13.8 inches x 9.8 inches x 9.8 inches, giving you plenty of storage space inside the unit to store such things as money, a firearm, or important documents. The safe only weighs 14 pounds, but comes with a durable body that is 2 mm thick and a door that is 3 mm thick to give you a durable and safe place to store your valuables. For mounting bolts are included as well as the hardware to be able to install this lockbox. Because of its weight, it is not difficult for even one person to be able to mount the lockbox in place. Maybe you are looking for nothing more than a simple box to be able to store your items with a security measure in place that is also fire retardant. If that is the case, this is the ideal box for you. This box measures a little over 12 inches by almost 11 inches by 4 inches deep. 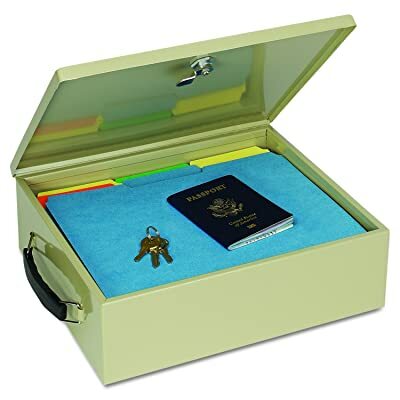 It makes it the perfect box for you to be able to store important documents you need, giving uses security of having a lock to store your items, while also being a fire retardant box. This lockbox can withstand heat up to 750°F for up to 15 minutes. That should be a significant enough amount of time for you to be able to contact the fire department and have them douse the flames before the items inside your box are destroyed. In addition, because of how lightweight the boxes, it is easy for you to grab and take with you should you face some kind of home disaster. This means you don’t have to necessarily trust the box to protect your items, either from flood or fire, because you can quickly take it with you. A single key lock provides an added level of protection. However, you should not mistake this as an inability for a would-be burglar to gain access into the box. It is a simple lock that will keep your kids out, but don’t fully yourself as to the level of protection it provides. The box is built with a durable steel construction, with double insulated walls to protect from fire damage. Paper items will be protected for up to 15 minutes, while other valuables you have in the box should be protected for twice that length or even longer. Because of its size, you are easily able to store legal sized documents, as well as external hard drives, flash drives, and other forms of media. It comes in a few different colors, and weighs no more than 1 pound empty. Fireproof Safe Buyer’s Guide : How to Make the Right Choice? If your gun safe is not durable, it will be the same as storing your items in a wooden box. It is extremely important to take into account the type of materials that have been used as they will immediately add quality in case you wish to own the best gun safe.The benefit you will receive from this quality is value. The safe will be able to withstand prying for longer and even withstand all common hand tools. Many of these steel designs are also capable of withstanding heat and water as well. The biometric locking feature is much more expensive, but it does offer a lot of quality. They will obviously increase the price of the gun safe. Biometric gun safes are proven to be much more reliable than the standard mechanical safe and this must be taken into consideration when you buy a gun safe. I highly recommend biometric locks for people with extremely sensitive information and firearms as they will ensure that intruders take more time to try and pry open your gun safe and you will have the benefit of quick access. 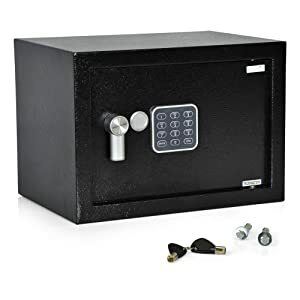 Before closing out this review, I thought it would be a good idea to answer some of the most commonly asked questions regarding these kinds of safes. #1 What Constitutes a Gun Safe “Fireproof”? A safe with fire proof certification and standard, does not mean that it will withstand any kind of fire hazard. There are some safes which are able to withstand fire for a few hours before they start to melt, it is after all made up of metal. Metal is vulnerable to fires and therefore can withstand fire only if it is made very strong. However, the fire department and owners will gain time, if the user has already locked down all their guns and possessions in a fire proof safe. Burn off time on a fireproof save is what shows its mettle, the manufacturer should be able to provide this information, if the safe has gone through standard testing. #2 Do Fireproof Safes Really Work? No safe is completely fireproof and no matter what the quality of the safe. If someone claims that their safes are 100% fireproof, they are lying and trying to take your money. Fireproof gun safes are only fire resistant for a certain period of time and under a certain temperature. It might not last through an entire house fire, but most fires only last a certain time and if you have a quality fireproof home safe, it will surely save you a lot of unnecessary damage that could have been avoided. This needs to be taken into account and it will not help if you have extreme temperatures close by and your safe can only resist 800° F.
#3 Why Choose a Safe with Fire Resistant Properties? Gun Safes, which are not able to provide protection from fires are a definite no, when investing in a locker for the safe keeping of firearms and other valuables. Fires occur suddenly, without a warning, they happen as a consequence of an accident. Fires have proven deadly, they can sometimes bring down and entire house or row of houses in the matter of few hours. Even with a fire brigade trying to reduce the fire, wind and weather do not always cooperate. Having a fire proof safe, thus, will allow much needed time, before owners are able to lessen the fire and pick up their belongings. #4 What Fireproof Safes are Made of? Fire safes are made of rust proof heavy alloy metals. These metals are further enhanced to give them strength, also giving them the quality of withstanding fire for longer periods of time. These fireproof safes are made with special moulds, which cannot be penetrated easily. It takes a strong fire that reaches high temperatures and has consistency over many hours, in order to completely melt a gun safe. Locks for such fireproof safes are also made to withstand, not just fire, but also complement the overall functionality of the locker. The hinges, fittings and locks are all made with equally strong materials; they are fit snugly to not let anything seep into the safe. #5 Where to buy a fireproof safe? You can buy a fireproof safe in a number of locations. However, there is one factor you should consider before making any decision upon where you will buy the product. Most of the safes are extremely heavy, often weighing as much as 150 pounds. This is not something you are likely going to be able to take them yourself, especially if you have a small car. Wherever you choose to buy the safe, it should be from a location where they will deliver it to you, and this is why many have opted to go with Amazon, especially if you have the free prime service. #6 What is a good fire rating for a safe? The best fire rating should be somewhere around at least 1700. This means that if heat reaches 1700°, you’re safe will be able to be resistant to the heat for at least one hour. You should be aware that fires rarely reach that temperature, most often coming around 850° at most. With the higher fire rating you can be sure that your items are going to be protected for a much longer period of time. #7 Are fireproof safes waterproof? Some are. You are likely going to find that the very best fireproof safes also come waterproof. Most will give you up to 24 hours a protection if they become submerged, and that should be ample time to get out the items you have in the safe should such an emergency arise. #8 Is keeping cash at home safe illegal? This is kind of a trick question. If you have made money that the government is aware of, such as true a business venture, job, or other legitimate means, you can be sure that storing money in your safe is perfectly legal. It’s your money, and the government is aware you have it. However, if you have undeclared money sitting in your safe then yes it is illegal. You must consider that it’s not so if they never find out about it. #9 What is The Best Fire-safe? In our research, I found all these top rated fireproof safes to be useful and unbeaten. I would like to recommend you to pick any one of them accord your requirement. Whatever, I personally use SentrySafe SFW205GQC Fire Safe for storing my handgun and essentials at my home. It not only keeps the precious valuables and documents from desecrating in the heat, but it also ensures that the items are kept dry in the case of sprinklers or if the flames are doused. It is extremely affordable and even though it cannot house rifles, the small compact frame keeps smaller items secure and the keypad allows to easily and quickly access firearm in the time of need. Overall, I think this is a must have safe for anyone with a small firearm and looking for a mixture of great features, quality and durability. I hope you can now make a better and more educated decision about buying a fire-safe. The best fireproof safe may just be the thing you need to give you that added peace of mind and allow you to rest better knowing that everything is in perfect order. Let us know if you have any questions about a fireproof safe and the quality of steel that has been used in the construction. Moreover, if you already own a fireproof safe you can share your opinion to help others make the right choice. I just check out your post on fireproof safe. I have experienced a disastrous fire that destroyed my home staffs. I own a large Vaultek gun safe but I don’t think that can resistant. How can I make that fireproof or I need to bought another safe? I have been exploring this topic for almost three weeks now and this really is the 1st posting which actually seems sensible. Why is it so difficult to locate quality specifics on the topic of security and safety these days? Definitely respect the effort you invested placing your ideas into words so newbies similar to me can certainly take a step. Many thanks!